There’s so much material in this house. When you think of a Neil Simon movie, Barefoot in the Park (1963) and the Tony-Award winning The Odd Couple (1965), raucous laughter instantly comes to mind. Seriously, who can forget Jack Lemmon as germ-a-phobe Felix Unger, in The Odd Couple, the way he hysterically cleared out his sinuses with that horrendous blow-horn sound. Whether it was comedy or drama, Mr. Simon knew how people ticked, especially in families. Broadway Bound is the last part of the Eugene trilogy. It starts with Brighton Beach Memoirs, then Biloxi Blues. 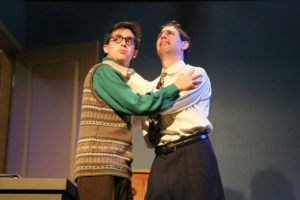 Broadway Bound continues with the efforts of Eugene Jerome (a talented Josh Reiter) and his older brother Stanley (the equally gifted Mathew Nye) to launch what would be a longstanding career in film, theater and television. Mr. Simon allows the audience in taking a peek of him growing up in the Bronx, New York with his mother Kate (Jill Remez), father Jack (Mark Sande), aunt Blanche Morton (Maria Spassoff), and his socialist grandfather Ben Epstein (Shelly Kurtz is absolutely fun to watch). Kate takes care of the home while Jack becomes weary and frustrated from working two jobs. The sons have big dreams to make it into show business. Eugene works in a stockroom of a music room while brother Stanley manages a boys’ clothing store at Abraham and Straus. Stan managed to work out a deal to write for The Phil Silvers Show at $200 a week for the both of them. Like Superman, they grind at their day jobs and at night they turn into “established” comedy writers. Where Kate is more encouraging, Jack believes his sons are wasting their time and should move on to something more stable. Their marriage is very tense and the family feels it. Kate keeps busy tending to the house whereas Jack repeatedly comes home late from work. She’s aware of his infidelity but acts as if nothing is wrong. Grandfather Ben is too busy putting his socialist ideas to work and finds comfort in reading Leon Trotsky. He encourages his grandsons to write political satire, because unlike their radio show, satire has a point. However, he does notice a change in Jack and confronts him. What happens is an intense conversation where the truth not only hurts, it’s the gospel. The boys get the idea of putting their family drama on blast in the form of a radio show. They protect the “innocent” by changing the names but it’s clear to Jack that his sons wrote about the family. The only respite Kate’s allowed is when she evokes the sweet memory she had as a young woman who danced with actor George Raft when he was a “greasy-haired” struggling actor. Eugene insists on Kate showing him how it was done. They moved expertly and fluidly across the small, living room floor. It’s one of those rare moments where Kate is smiling and giddy. Remez is wonderful and kind and caring. It’s real how much she loves her boys and supports their dreams. Remez’ maternal bond is real and it shows. Mr. Kurtz as the grandfather Ben Epstein, brings in the humor when things become extreme. Jack is a complex character. Yes, he does love his family and still loves Kate, but, he needs something more. Something more tangible and belongs solely to him. He finds that void in another woman. His cheating devastates the family, but, makes them move forward. Ben finally decides to move to Florida where his wife lives. The boys finally leave home and make their mark in television in New York. Kate stays behind cherishing her sweet, memory on dancing with George Raft, who later be acquainted with gangster Bugsy Siegel. 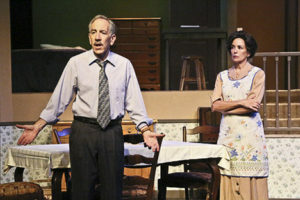 The West Coast Jewish Theatre produced this highly impressive and hysterical show. Reiter does the most excellent job portraying a nebbish, worrisome writer who is so filled with doubt about making it as a writer. His octane energy and thoughtfulness makes him more likable. With his brother who got his back, Jerome/Simon become memorable. Marvin Neil Simon passed away on Sunday, August 26, 2018. Broadway Bound plays Thursdays, October 11th, 18th, and 25th, Fridays and Saturdays at 8 p.m., and Sundays at 2 p.m. until Sunday, October 28th, at the Miles Memorial Playhouse, located at 1130 Lincoln Blvd., in Santa Monica. For ticket information, call (323) 821 -2449 or reserve online at www.wcjt.tix.com.